These NON-Molasses blocks are designed for essential fortification of dry cow requirements for vitamins A, D & E, protein, calcium, phosphorus and trace elements including selenium. High vitamin E and low NaCl salt with anionic emphasis helps fight milk fevers and udder edema. 1,100 units of vitamin E in combination with selenium (8 ppm) enhance the body defenses to protect against infectious agents for better calving, cleanup and rebreeding. 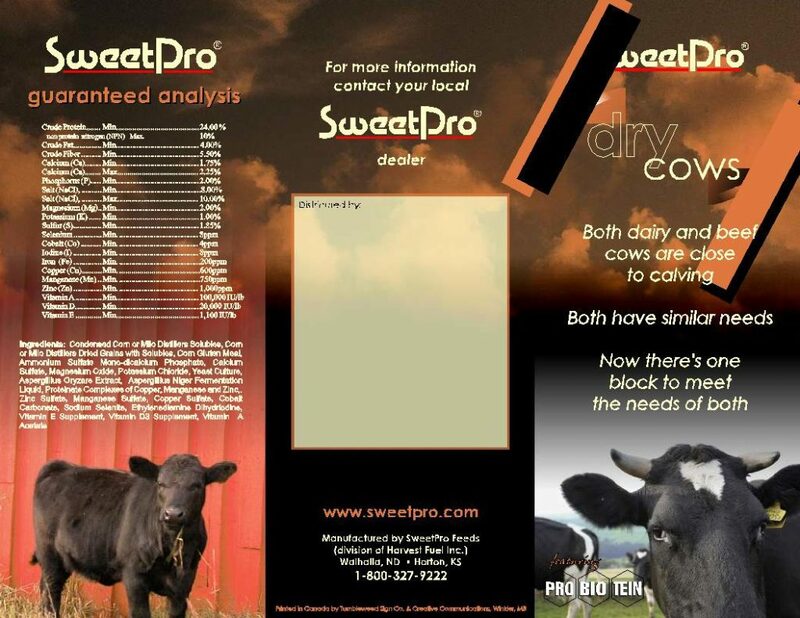 SweetPro’s Dry Cow (Calver Breeder) blocks also have a solid magnesium profile and limited sodium chloride salt–thus minimizing the chances of udder edema. Instead, the emphasis is ANIONIC salts to prevent milk fever. Use of the anionic salts (ammonium and calcium sulfate) shifts the dietary cation-anion balance in a more anionic or negative direction to help lower blood and urine pH, increase calcium absorption and mobilization, cause higher blood calcium levels and decrease the incidence of milk fever. Note: The horn fly control ALTOSID® IGR may be added to any of the SweetPro tubs. This may provide effective fly control for 3 ½ to 4 cents per head/day. During horn fly season, without fly control, daily average gain may be reduced by 0.25 lbs. per hd/day. But an Altosid IGR (Insect Growth Regulator) feed-thru fly control investment of $4.50 to $5.50 per cow/calf pair for a summer feeding season will yield returns from 6:1 to 10:1. 2. Energy in SweetPro blocks comes from complex carbohydrates instead of the simple sugars of molasses. This supports resistance to digestive disruption from sugar and starch (No Negative Associative Effect-NAE) digestion on the microbial populations which digest fiber in the rumen, keeping rumen pH high for health support. One tub per 25 head of cattle. Place away from water source. Tubs can be space fed. 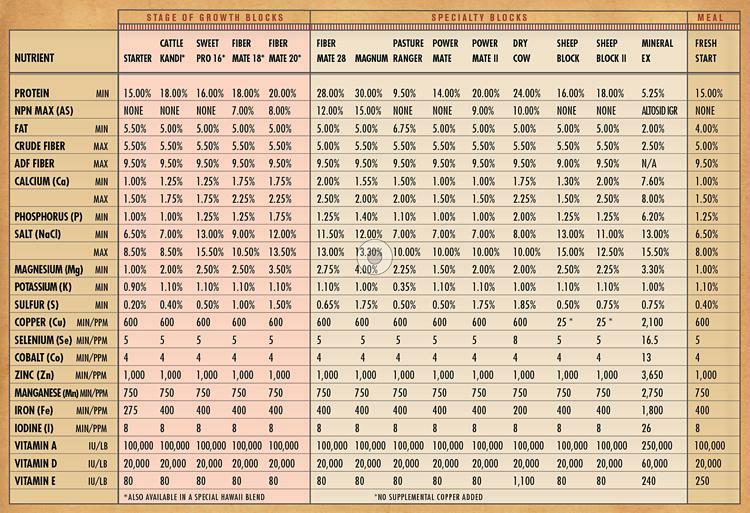 Place the appropriate number of tubs with the desired group of cattle assuming a consumption rate of 1-1.5 lbs. of product per day. For example, if the tubs are expected to last 7 days, then don’t place new tubs in pasture or feeding area until this day has been reached. The product will stay in the animal’s system for multiple days even after the feed is gone.